Made from 100% handwoven cotton. This shirt is based on a centuries-old design as worn by Thailand's ubiquitous rice farmers as they ploughed their rice paddies. 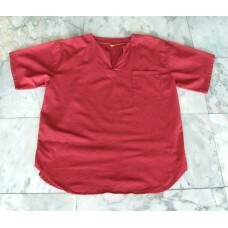 Traditional design has short sleeves, one breast pocket, no collar and V-neck - perfect for yoga! Shirts come in one large size -- see photos -- meant to be worn baggy, traditional Thai yoga shirts are large enough for almost all sizes to wear with comfort.